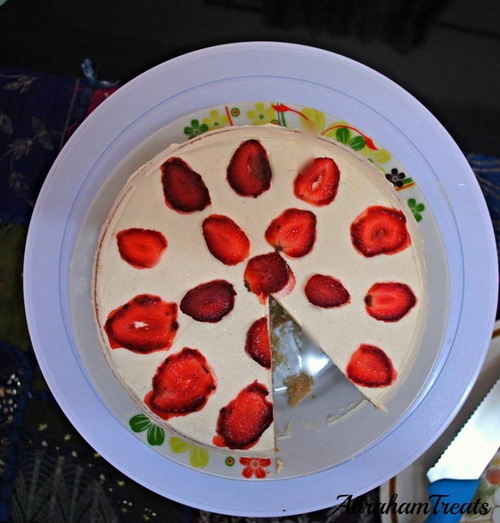 I met Shazzy through Rafeeda’s blog where i guest posted one year ago and i loved Shazzy’s Blue velvet cupcakes.I decided to invite her for a guest post she is running her blog SEASONED WITH SHAZZY ,you can visit her for more delicious recipes . A very nice person and a professional cook. I am very thankful to her for giving me her precious time. Salam and good day lovelies, recently I have received an invitation message by Mrs. Ainy. I basically don’t know Ainy that well but thank you Ainy for inviting me as one of your guest post. I was looking through all the recipes I’ve and think which one would be a perfect guest post..
Well, finally found this perfect delicious treats perfect for everyone! Uhmm..Yes, it’s totally YUM! Every bite is just to the perfection..I love this cake so much because it have the combination of sweet and sour  oh yes, it’s perfect! Look at the picture?! 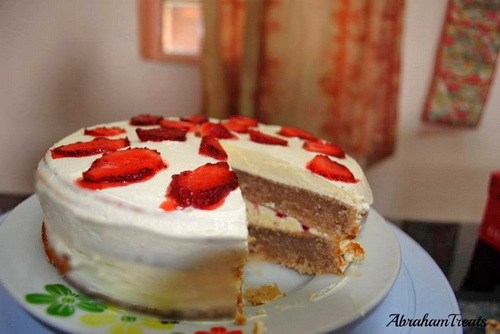 Is just scrumptious  and it called Strawberry Cake. I don’t usually share my cake or cupcakes recipes on the blog but I’m starting after I’m back from my long holiday sooner. Bake the cake: Preheat oven to 350 degrees F. Line two 9-inch cake pans with parchment paper. Lightly coat the pan with butter, dust with flour, and tap out excess. Set aside. Sift the flour, baking powder, salt, and baking soda together and set aside. Cream the butter and 1 1/2 cups sugar until light and fluffy in a large bowl using a mixer set at medium-high speed. Add 3/4 cup strawberry and the eggs, one at a time, blending each addition thoroughly. Scrape down sides of bowl and beat in vanilla extract. Reduce mixer speed to low and add the flour mixture by thirds, alternating with the buttermilk and ending with a final addition of the dry ingredients. Divide the batter equally between the pans and spread evenly. Bake on the middle rack of oven until a tester inserted in the center of each cake layer comes out clean — about 20 to 30 minutes. Cool completely on a wire rack. 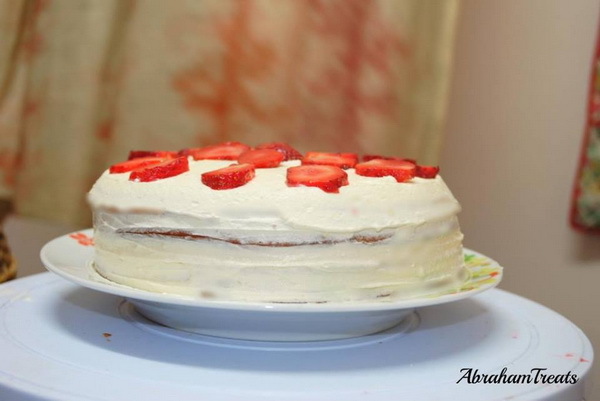 Assemble the cake: Beat the cream and remaining sugar to soft peaks and spread over the top of one layer. Top with strawberries. Serve immediately. Tip: if you want it to have a pink colour, you can add a little pink colour in the mixture.